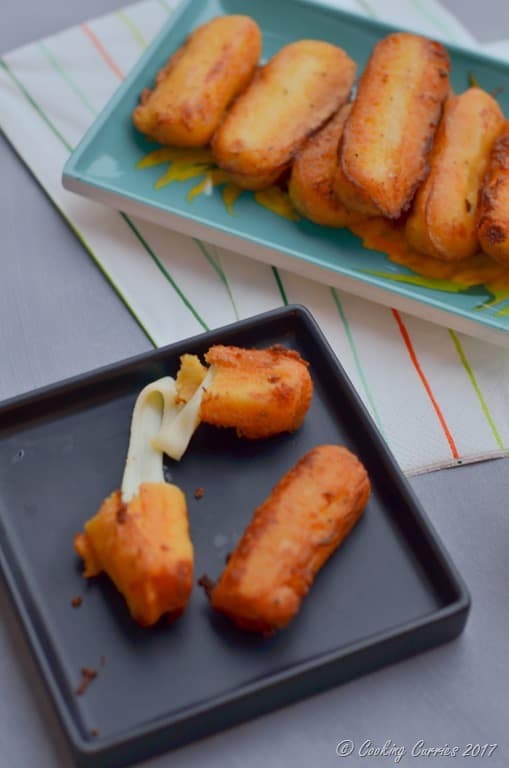 An Indian twist to the popular mozzarella sticks snack, kids and adults will equally love these Mozzarella Sticks Pakoras and it is gluten free too! Having grown up in India for most of my life and lived here in the United States for most of my adulthood, my cooking style has evolved to often incorporate very desi ( slang for anything Indian / South East Asian) flavors and methods with ingredients that you find more commonly here. I think it’s a fairly common thing that happens to many in my situation. It is such a good thing to have that luxury to chose from two different cuisines that are so far apart and still so very familiar to me to come up with these unique twists. Bajjis or Pakodas are basically any vegetable or here, cheese, dipped in a batter of besan (shelled chickpea flour) and spices and deep fried. These usually accompanies the evening chai. There is a little story to this recipe, as with most other recipes I post here. 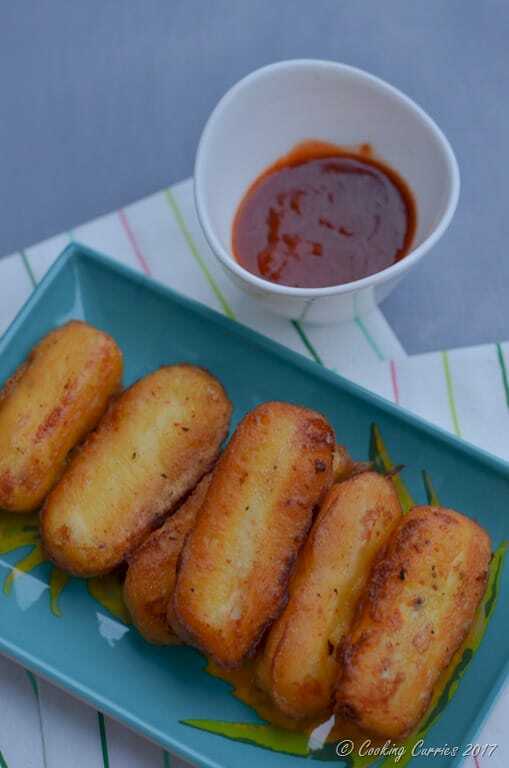 I had this idea to make Mozzarella sticks pakodas or pakoras or bajjis, what ever you want to call them, for a really really long time and many a packet of mozzarella string cheese have been bought and consumed while they waited to be made into these bajjis. Finally one day I decided to make them before yet another packet is consumed and I have to wait till I buy more. So I made the usual pakora batter, heated oil for deep frying and dipped my cheese sticks into the batter and then dropped them into the hot oil. Only to see that the cheese started oozing out of the batter and it ended up as a mess of fried cheese and random cooked and uncooked batter bits floating around. Yes, it was as unappetizing to see as it sounds. I was very disappointed and while I was having chai with my friend who had come over to my house when this disaster of a pakora happened, all I could think of in my head was to figure out how to make this work. Then I realized, usually for pakoras / bajjis, you fry them in medium –high heat oil for a long time to make sure the insides cook well as well. But here, I did not need to insides to be cooked, its cheese! I just needed the outside batter to cook well and I knew that the trapped heat will melt the mozzarella cheese inside to make it gooey enough. And just to be safe, I tucked the cheese sticks into the freezer for a few minutes while the oil was heating up. And this time it worked. 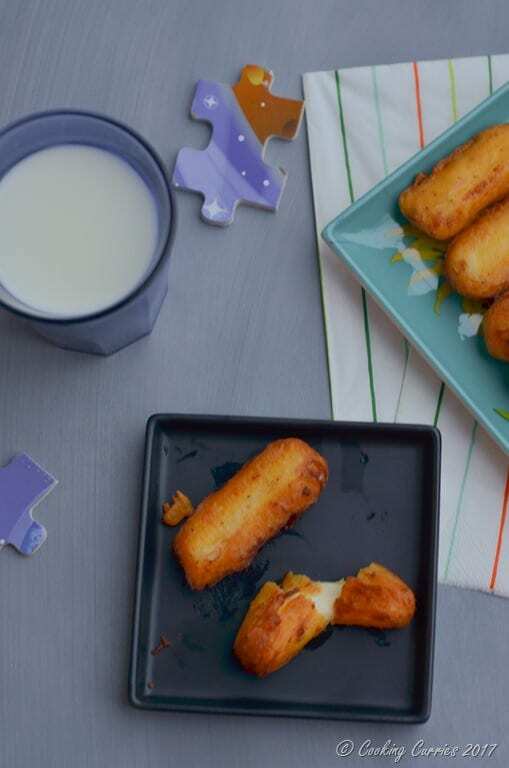 And the kiddos verdict – “ I love this new cheese snack, amma!” Well, that’s that then I hope you make this and your kids love this as much as mine did! Disclaimer: This post contains afiiliate links. When you click on them and buy something, I get a percentage as commission but at no extra cost to you! It helps keep the blog runnning and to bring you more delicious recipes. Put the mozzarella string cheese in the freezer while we make the batter. Heat oil in a deep frying pan. Mix the besan, rice flour, salt, caynne, asafetida, ajwain and baking powder. Add the water, a little by little, and mix well with a whisk till you get to a pancake batter consistency. Once the oil is hot enough – you can test this by dropping just a little bit of the batter into the oil, if it rises up immediately, the oil is hot enough. Bring the mozzarella cheese out of the freezer and cut each stick in half. Dip each half into the batter and drop carefully into the hot oil. Do not crowd the pan, or else the pakoras will stick to each other. Flip them over in about half a minute of so to cook on the other side and then drain them onto a plate covered with paper towels. Repeat till all the cheese sticks are done. Serve hot with ketchup or your favorite dipping sauce to dip in. Put the mozzarella cheese in the freezer while we make the batter. Heat oil in a deep frying pan. Bring the mozzarella string cheese out of the freezer and cut each stick in half. Dip each half into the batter and drop carefully into the hot oil. Do not crowd the pan, or else the pakoras will stick to each other. Flip them over in about half a minute of so to cook on the other side and then drain them onto a plate covered with paper towels. Repeat till all the cheese sticks are done. This looks yummy, but whenever i try to make cheese balls or potato sticks the cheese doesn’t come as shown in pic above .what kind of cheese do i need to use? i had used normal cheese cubes. 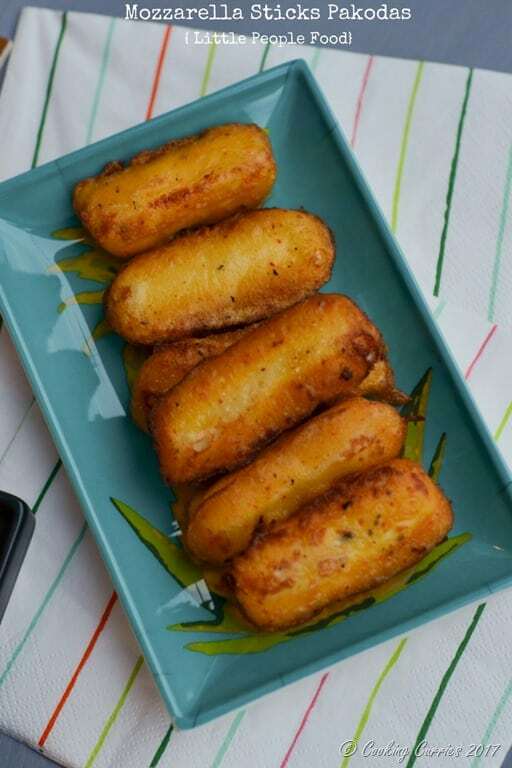 Priya – these are mozzarella cheese sticks. Mozzarella is the one cheese that gives that stringy texture when heated. Ohh ! thanks for the reply dear..so your saying once its deep fried it will get melt inside and form like this….